Cooking your food to perfection is just one way that the stylish stainless steel Frigidaire Professional™ Convection Toaster Oven helps make life more convenient for you. The Convection Toaster Oven features a sleek and easy-to-read design so everything from dinner preparation to reheating is a simple, time-saving joy in the kitchen. Frigidaire Professional™ appliances are specially designed to make your time in the kitchen more efficient. With time-saving convection cooking and Rapid Cooking Infrared Technology there is less waiting when you are hungry for a snack or an entire meal – the Convection Toaster Oven is a perfect option. 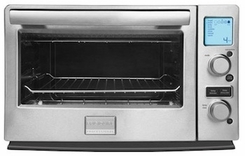 The Convection Toaster Oven’s technology makes cooking faster than working with your kitchen oven. The Frigidaire Professional™ Rapid Cooking Infrared Technology helps speed up the process of preheating and cooking for less wasted time. Choose your cooking method with just one touch. Select bake, broil, toast, defrost or one of several other cooking options to quickly and perfectly cook your food the way you want it. Whether you are cooking for yourself or a hungry crowd, you are ready. PowerPlus™ Preheat technology heats up the Convection Toaster Oven quickly so there’s less waiting for preheating and more time available for cooking. Frigidaire Professional™ kitchen appliances are known for their attractive design and powerful, easy-to-use features. Now that same level of high performance, durability and style is available in the new small appliance collection.The Frigidaire Professional™ Convection Toaster Oven offers time-saving PowerPlus™ Convection cooking and Rapid Cooking Infrared Technology, so there’s less waiting when you’re hungry for a snack or an entire meal. Its attractive stainless steel design, simple controls and powerful features offer high performance and function that help you achieve great results.